Dr. Parafulla Kumar Sen, popularly known as Dr. P. K. Sen was a great Bengali surgeon of Twentieth century. Dr. Sen was born on 7th December 1915 at Calcutta, the then capital of undivided Bengal, in a middle-class family. Hehad 1 sister. As the only son of a civil surgeon, Profulla became interested in surgery. He studied initially at a municipal school in Jamtada, a small town in the state of Bihar, had his early college education at Victoria College of Sciences, Nagpur, and studied at Seth G.S. Medical College, Bombay for MBBS from 1933 to 1938. In 1940, Dr. Sen took master’s degree in surgery with distinction from the University of Bombay. Until his death on 22 July 1982 due to myocardial infarction, Dr. Sen held various posts at King Edward Memorial Hospital (KEM), Bombay. The department of cardiothoracic surgery at KEM was founded by him and now bears his name. In 1954, Sen married Marie Barnes, an American who worked at a physiology laboratory in Philadelphia, US, whom Sen himself met while he was working at the University of Pennsylvania during 1950–1951. They had no children. Regarded as the founder of cardiothoracic surgery in India, Dr. Sen performed the first intracardiac operation of any kind, closed mitral valvotomy in 1952, closure of ASD with the aid of hypothermia and inflow occlusion techniques in 1957, before doing so with the aid of extracorporeal circulation in March 1962. He also made very significant contribution in the development of transmyocardial revascularization by acupuncture, a new technique for aortic arch replacement and described a group of nonspecific vasculitis. In 1954, citing the possibility of heart transplantation, Dr. Sen and his team started many animal experiments. The astonishing news on 3 December 1967—that Christiaan Barnard of South Africa had performed the 1st human cardiac transplant—gave a sense of urgency to investigators worldwide who were close to clinical application of what they had learned in the laboratory. As a last step, Sen and his team studied human cadavers for details of the operative anatomy as it pertained to both donor and recipient. 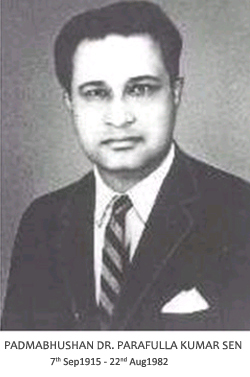 On 16 February 1968, Dr. Sen performed the first heart transplantation in this subcontinent. His colleagues included surgeons like Dr T.P. Kulkarni, Dr G.B. Parulkar, and Dr M.D. Kelkar. He was in frequent touch with his contemporary greats in Cardiac Surgery like Dr. William Bigelow, Dr. Denton Cooley, Dr. Norman Shumway, Dr. Christiaan Barnard, Dr. Donald Ross, and Sir Brian Barrett-Boyes. An excellent teacher, Dr. Sen enlivened his lectures with poetry, philosophy and quotations from the history of medical science. He had a charismatic influence upon his students, who included Dr. R.A. Bhalerao, Dr Sharad Panday, Dr Nitu Madke, Dr S.A. Padmavati, Dr Sudhanshu Bhattacharya, Dr M.S. Valiathan, and Dr Arun Chaukar. When Dr Sen ventured beyond the subject of surgery, he did so with authority, for he was both a poet and a painter; his paintings were exhibited twice in India and once in the United States. He was the President of the Association of Surgeons of India in 1971-72 and was awarded the Padmabhushan, the Highest Civilian Order at his life time given by the Government of India. The Association of Surgeons of India Instituted the Dr P. K. Sen memorial Oration in the revered memory of its Past President in the year 1993.